This common, everyday spice deserves more attention! Most people are unaware of the numerous health benefits offered by the little, precious peppercorns. 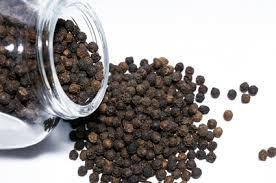 About 4,000 years ago Black Pepper was actually used as currency in the marketplace; a highly prized commodity. The pepper plant is a tropical climate vine native to India - that produces tight clustered flowers that later bear the seed we know as peppercorns. Today’s top producers of Black Pepper are India and Indonesia. One of the benefits of enjoying Black Pepper is as a digestive aid. It creates a loop-back effect where the pepper stimulates the salivary glands that in turn tell the stomach to increase production of hydrochloric acid, which is used to breakdown proteins and other foods within the stomach. Without enough hydrochloric acid food sits in the stomach undigested for much longer periods and causes heartburn and indigestion. Black Pepper is also carminative. That means that it actually helps prevent intestinal gas from being formed in the first place. A constituent (alkaloid) of Black Pepper, called Piperine, is responsible for increasing serotonin levels that enhance mood. A promising find - Black Pepper has been shown to fight cancer by interrupting the signals sent between cancer cells. Black Pepper is a great source of Manganese, Vitamin K, Iron, and Fiber. Additionally, Black Pepper also offers a wide array of antioxidant and antibacterial properties; and is a rich source of phenols, making it an all-around super spice. And, if that weren’t enough, the outer layer of the peppercorn seed aids in the breakdown of fatty tissue. Adding Fresh Ground Black Pepper to a multitude of dishes not only enhances taste and the bio-availability of the other nutrients in the meal…it’s just plain good for you! **People with ulcers and those undergoing abdominal surgery should avoid using Black Pepper. Always consult with your physician, nutritionist, or health care practitioner before drastically changing your dietary habits. by TR Hughes, © 2008 - 2017 GuideToLifeForWomen.com. All rights reserved worldwide. Health and nutrition information provided is for informational and educational purposes only and is not intended to be used as a substitute for advice provided by your physician, nutritionist, or health care provider. You should not use this information for diagnosing or treating any health condition or disease or for prescribing medications and/or other treatments. Please consult your health care provider or nutritionist before starting any new diet or exercise program. Information and statements have not been evaluated by the Food and Drug Administration. Excellent article! Black pepper has so many great properties--who knew? I have added black pepper to hot tea (along with cayenne pepper) to make a detox special. It makes me sweat like mad! Toxins be gone! wow thanks for this article :) I love pepper. I always put them on any dish I cook.. I never realized there were so many health benefits to black pepper. This was a wonderfully informative post. I LOVE fresh ground black pepper!!! Have to keep it away from Hubby though ~ he sneezes like a crazy man around pepper!